Completed in 1918 as a troopship (with only one funnel), Regina spent that year and 1919 on trooping service. After World War I ended, she was returned to Harland & Wolff for completion of her original design, which included the second stack shown in the cards below. Regina made her maiden commercial voyage, 16 March 1922, Liverpool-Halifax-Portland, in the White Star/Dominion joint service. At this point, she was painted in Dominion colors but registered to IMM's Leyland Line. 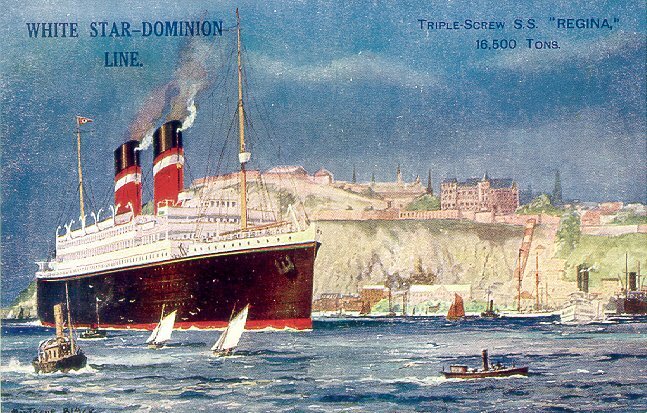 She was transferred to White Star, and painted in White Star colors in 1925, when Dominion effectively went out of business and the joint service was absorbed by White Star. 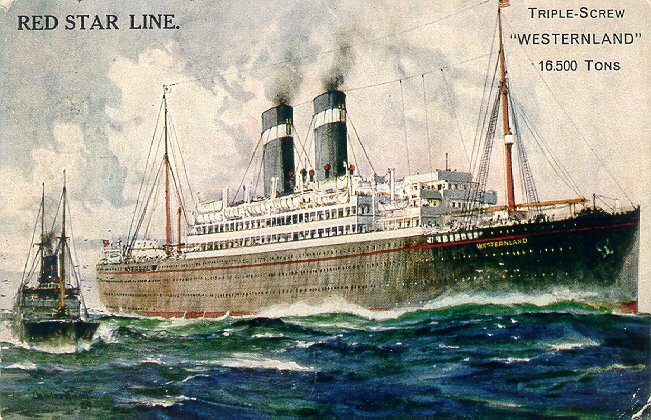 She was not renamed, however and thus posed a classic example of the sometimes confusing results of IMM's ship-transfer policies: she owned by Leyland, painted in White Star colors, with a Dominion name. 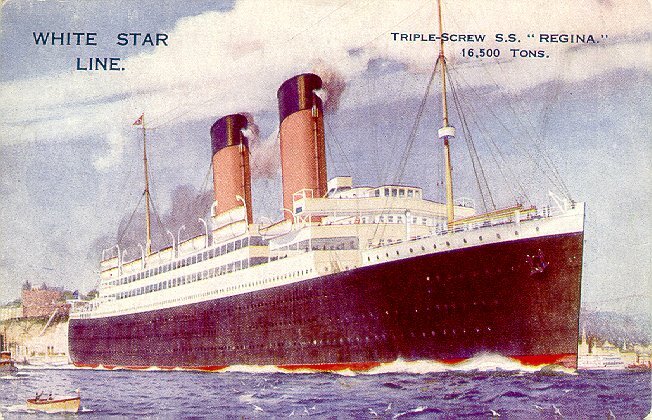 She made her first White Star voyage, Liverpool-Halifax-New York, in December 1925 and her last, Liverpool-Belfast-Glasgow-Quebec-Montreal, in November 1929, three years after IMM sold White Star. Regina was transferred to IMM's Red Star Line in December 1929, although still registered to Leyland, painted in White Star colors, and bearing the Dominion name. 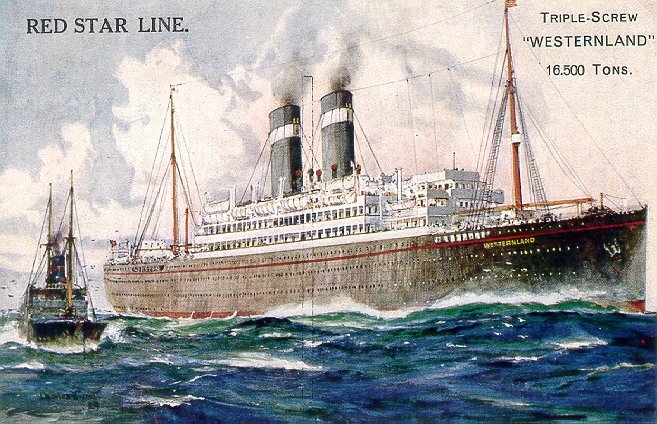 She was eventually renamed Westernland and was repainted in Red Star colors in 1930. She served on Red Star's Antwerp-Southampton-New York route and made the final sailing in Red Star's history, leaving New York for Antwerp,via Le Havre and London, on 12 December 1934. She was then laid up. 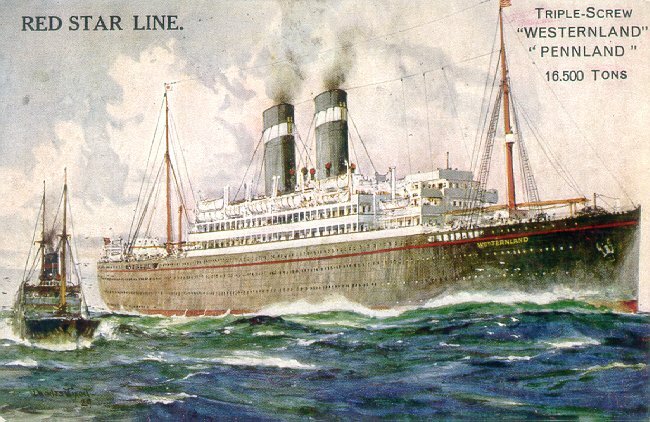 Westernland, her sister Pennland (ex-Pittsburgh) and the right to use the name "Red Star" were sold to Bernstein Red Star Line GmbH in 1935. Westernland was later sold to Holland America in 1939. Still named Westernland, she escaped to England when Germany invaded Holland in 1940 and served as the home of the Dutch Government in Exile at Falmouth, England, then as a troop transport, a repair ship and finally a destroyer depot ship. She was decommissioned in 1945 and returned to Cunard White Star as manager. Plans to refit her for use by Cunard White Star were abandoned due to her age, and she was sold in 1946 for conversion to whale depot ship, but that plan, too, was abandoned. She was broken up in 1947. Sources: Haws' Merchant Fleets; Bonsor's North Atlantic Seaway; Kludas' Great Passenger Ships of the World; Anderson's White Star.